Leonardo DiCaprio's still holding on to old flames ... until he notices he's been spotted by the paps. 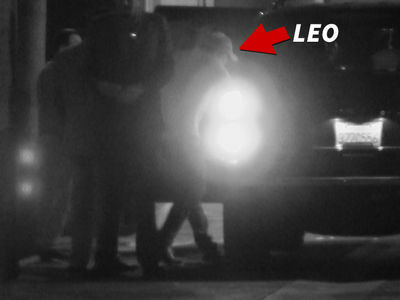 Leo was seen leaving 1 Oak in NYC early Saturday morning -- around 5 AM -- tightly holding hands with ex-gf and Victoria's Secret model Toni Garrn. We're told he arrived at the club earlier with a couple other gal pals, but left with Toni ... and a bodyguard. We're told the 2 quickly separated once they saw their pic being taken ... but got back together later. Leo and Toni starting dating back in 2013, but broke it off after about a year ... then she started dating NBA star Chandler Parsons. Garrn and Parsons split in November.